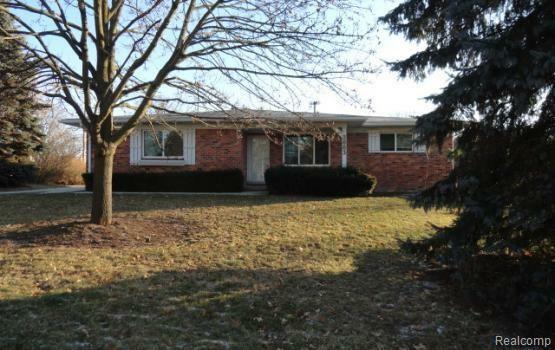 Spacious 3 Bedroom, 1.5 Bath Ranch on a corner lot in Bloomfield Hills, Bloomfield Schools minutes from I-75. Central Air, Sprinklers, with a Circle drive, and Patio door leading to your patio. Kitchen appliances include Stove, Refrigerator, Dishwasher, Disposal, and Micro-wave. Laundry in large basement with Washer and Dryer. Hardwood flooring in Living room and Bedrooms, Carpeted Family room off Kitchen with a wood burning Fireplace. "NO PET'S" 1 mo rent. 1-1.5 mo sec dep. $150 cleaning fee. $30 app fee. renters insurance req.